As children, many people took a beloved pet into the garden and buried it. Perhaps they erected a small cross made from Popsicle sticks over the grave. However, not all pets have had to make do with such modest, if heartfelt, memorials. Some monuments put up to ensure that an animal or group of animals is remembered forever have been so large or frankly bizarre that they cannot escape our notice. Here are 10 notable sites of animal remembrance. Science has been driven forward by the efforts of some unlikely characters. Human researchers should not get too proud, though. Many sacrifices in the name of science have been made by rodents. Lab mice and rats have allowed us to make huge strides in medicine, genetics, and a number of other fields. At one research center in Russia, it was decided that the role of these rodents in our advancement should be marked with a memorial. At the Institute of Cytology and Genetics in Novosibirsk, you will find a small bronze statue of a mouse. The jolly-looking creature is knitting the double helix of DNA, which lab rodents have done so much to help us unravel. 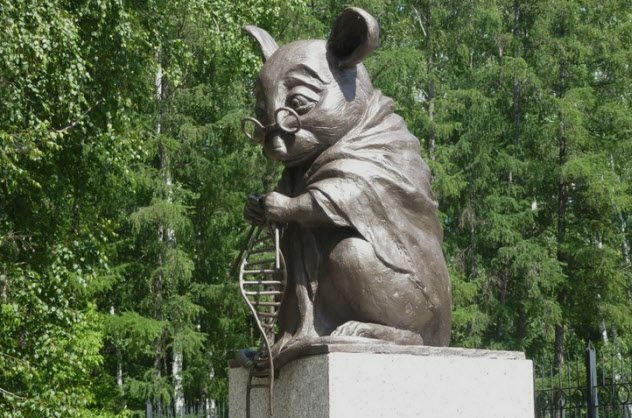 The sculptor said that the statue “combines both the image of a laboratory mouse and a scientist, because they are connected to each other and serve one cause.” The artist hoped to capture the moment of discovery in the mouse’s expression. It is said that cheese is milk’s leap toward immortality. However, although cheese generally lasts longer than the milk from which it came, cheese is not immune to attack. Bacteria, fungi, and even maggots all like to feast on cheese. So does the cheese mite. Cheese mites are close relatives of the mites which live on human tissue. They love to eat protein and fat, rich foods, whether that is dead human skin or a rich cheese. Due to their proclivity to poop in the cheese and open holes that let fungi and bacteria in, a colony of cheese mites is generally considered a bad thing. But not always. Some cheeses are thought to benefit from a mite infestation. One comes from Germany and is called Milbenkase (“Mite Cheese”). The cheese makers of Wurchwitz specifically add mites to their product to help age the cheese. Up to a year after the mites have been feeding on the now-black cheese, it is eaten by humans—along with the mites living on it. To celebrate the creatures’ role in this culinary delight, the cheese makers have erected a statue to the humble cheese mite. 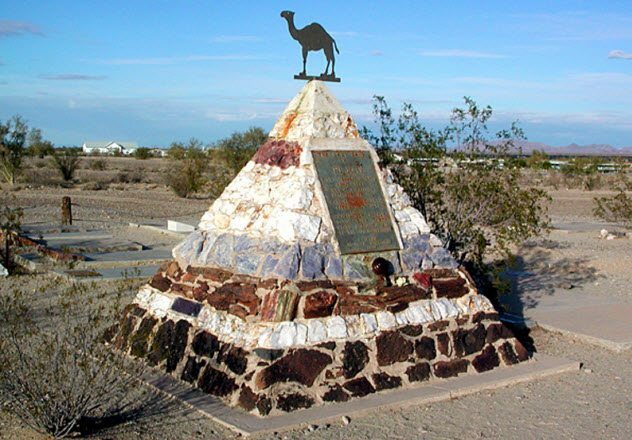 In Arizona, there is a monument to a man known as Hi Jolly and the camels which produced his fame. Hi Jolly (aka Hajj Ali when he moved to America) was hired by the US Army to introduce camels to the United States. It was thought that camels would be ideal beasts of burden in the desert states of the South. In 1856–57, 77 camels were imported to the US to test this theory. The experiment was something of a fiasco. Horses and mules, the main baggage animals of the army, were terrified of the camels. However, the camels were successful in crossing the desert regions of the Southwest, able to eat the scrub vegetation available. With the outbreak of the Civil War, the camel corps was disbanded. Many of the camels were set free and became wild herds. None survive now. In fact, the only reminder of this strange camel experiment is a pyramid topped by a camel that marks the last camp of Hi Jolly. In 2017, shareholders of a Chinese zoo decided that they were not getting enough return on their investment. They entered the zoo determined to capture some of the animals and take them outside to sell to anyone who wanted them. For some reason, they chose a donkey and a goat as the ideal animals with which to raise funds. When security tried to stop them, the shareholders pushed the donkey into an enclosure holding tigers. A video (which went viral) showed the donkey being mauled and killed by the tigers. The shareholders remarked that at least now they could be spared the expense of buying food for the tigers. 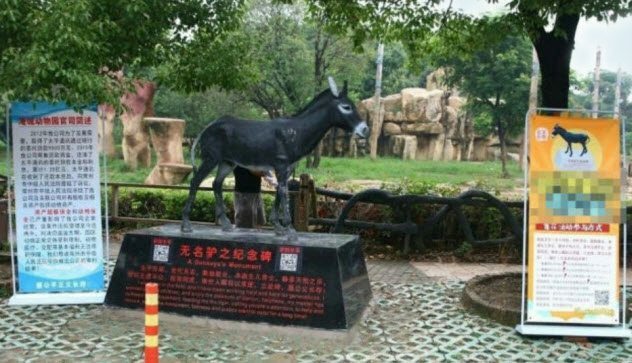 The goat was saved from the same fate by other visitors to the zoo. At Johns Creek in Georgia, there is a memorial to a dark period in the city’s past. According to local legend, a train crash happened nearby in the early 20th century. This train was carrying the animals for a circus, and a troop of monkeys managed to escape and flee into the woods. The local farmers, unsure exactly what these creatures were, opened fire, and thus, the Monkey Massacre occurred. While no one is sure if this event really happened, you may find some monkeys in the area today. 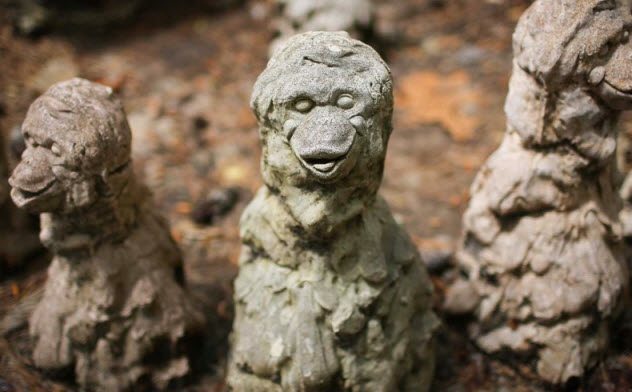 In the 1990s, a local artist donated a group of stone monkeys to the city to mark the spot of this terrible slaughter. City officials hope the memorial will act as a reminder to visitors that shooting an unknown creature dead is not the only option. 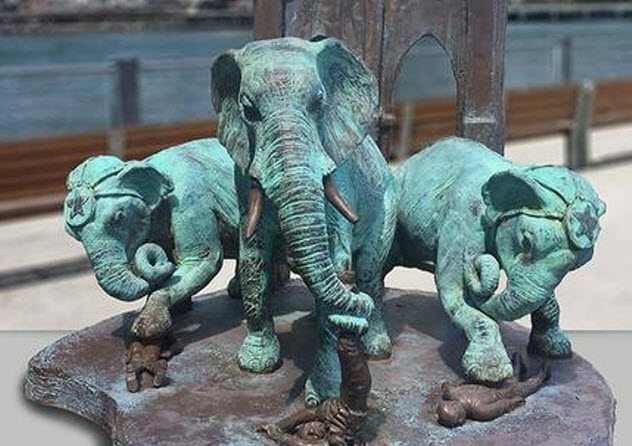 In New York, you may stumble across a weathered bronze statue dedicated to the Brooklyn Bridge Elephant Stampede. In 1929, crowds gathered to watch circus elephants, including the famous elephant Jumbo, march across the bridge. When the elephants panicked, they charged through and over the people lining the route. Many people died—at least if you believe the people who set up the statue. In reality, there was no elephant stampede. 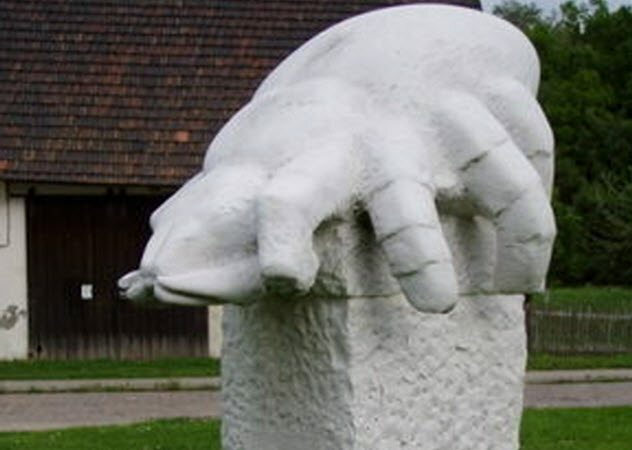 The artist who created this statue has previous experience when it comes to memorializing fictional events. In another animal monument set up a year earlier, Joseph Reginella commemorated the time that a giant octopus attacked a Staten Island ferry and dragged it underwater. His aim was to test the limits of people’s gullibility. To be fair, fake news can be hard to dismiss when it is cast in bronze. Enterprise, Alabama, calls itself the “City of Progress.” Throughout its history, the city has faced several crises and none was more challenging than the arrival of the boll weevil. The boll weevil is an agricultural pest that feeds on the buds and flowers of cotton plants. When it arrived in the Southern states of the US around the turn of the 20th century, the cotton industry was decimated. Crops failed, and many faced financial ruin as whole communities were threatened with bankruptcy. Yet it is to the destructive boll weevil that the city of Enterprise has raised a monument. The farmers of Enterprise were forced to diversify their crops, and peanuts turned out to be ideally suited to the land. Soon, Enterprise was flourishing as one of the great peanut-producing centers of the country. 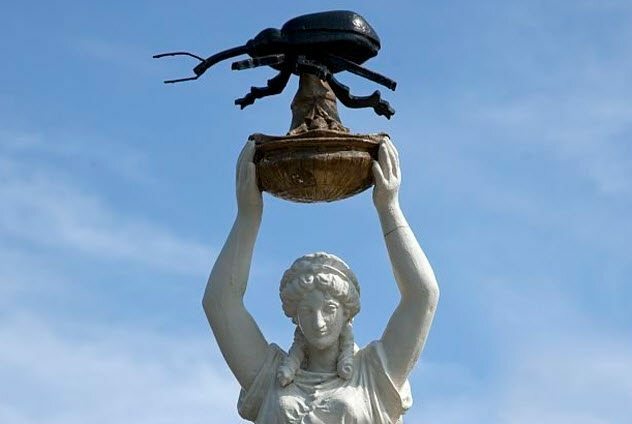 In honor of the beetle that forced them to turn to this new and profitable industry, a statue was built that showed a woman holding a boll weevil—the “herald of prosperity”—aloft. Although other animals had been launched into space, Laika the dog was the first animal to be sent into orbit around Earth. This was quite the achievement for a stray dog found living on the streets of Moscow. Unfortunately, it was an honor that Laika did not live long enough to appreciate. There was never any plan to retrieve Laika from space, and so the mission was always going to end in her death. Laika survived on Sputnik 2 for around five hours before succumbing to overheating. It was only in 2008, 51 years after her flight, that a memorial was put in place to celebrate Laika’s flight. Placed outside a military research station, the statue shows Laika perched on a rocket which transforms into a hand that cups the dog. 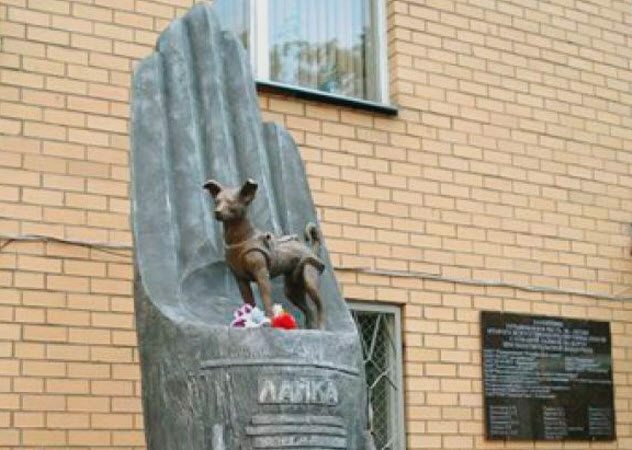 Though this was the first monument dedicated to Laika alone, she had been celebrated in other forms. Stamps, chocolates, and cigarettes were all produced in the Soviet Union with Laika’s face on them. The cod fishing industry was vital to the economy of the early colony of Massachusetts. To honor this part of their history in the state’s House of Representatives, a 1.5-meter-long (5 ft) wooden model of a cod hangs above the visitors’ gallery. The Sacred Cod, as it is known, faces the speaker of the house at all meetings and reminds everyone of the role that cod played in shaping the state. 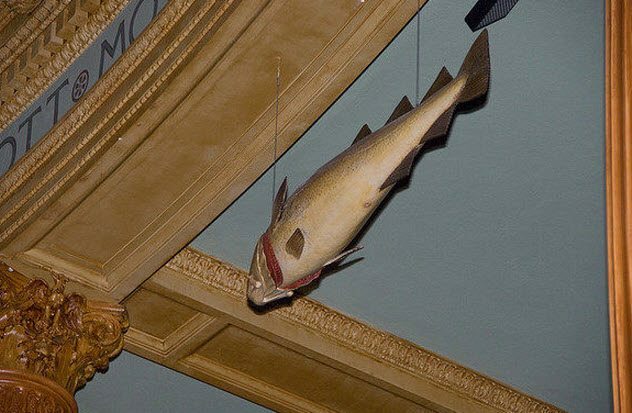 A model cod has hung in the meeting place of the Massachusetts government for over 200 years. In 1933, however, the sacred fish was cod-napped by the staff of The Harvard Lampoon. Entering the House, they cut down the cod and hid it in a florist’s box before simply walking out. Police were called to hunt down the missing fish. Without the comfort of their usual fish, legislators met and debated what charges to bring against the cod-nappers. After about 50 hours of chaos without the Sacred Cod, an anonymous tip was sent to Harvard police and the fish was returned. It remains in place to this day. The state bird of Utah is the seagull. This might seem an unusual choice for a state bird as it lacks the nobility or beauty of some other birds. But the seagull played a major role in the founding of Utah. Some members of the Mormon faith talk of a “Miracle of the Gulls” which took place in 1848. When Mormon pioneers arrived in Salt Lake Valley late in the planting season of 1847, they only managed to plant a very small crop which kept them alive into 1848. As a result, their second crop was vital to their survival. A swarm of katydids, now known as Mormon crickets, invaded the settlers’ farms and began to eat the crops they desperately needed. When seagulls arrived to eat the insects and save their plants, the Mormons saw it as divine intervention. 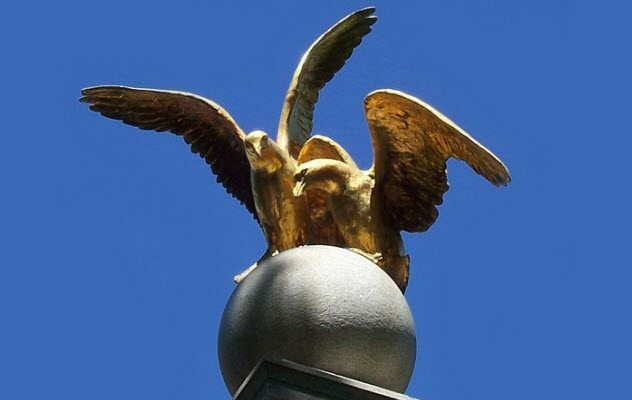 In honor of this “miracle,” a pillar was erected with two bronze seagulls at the top in Temple Square in Salt Lake City by the Mormon Church. Read about more unusual and even controversial monuments on 10 Unusual Statues And Monuments From Around The World and 10 Monuments More Controversial Than The Confederate Statues.